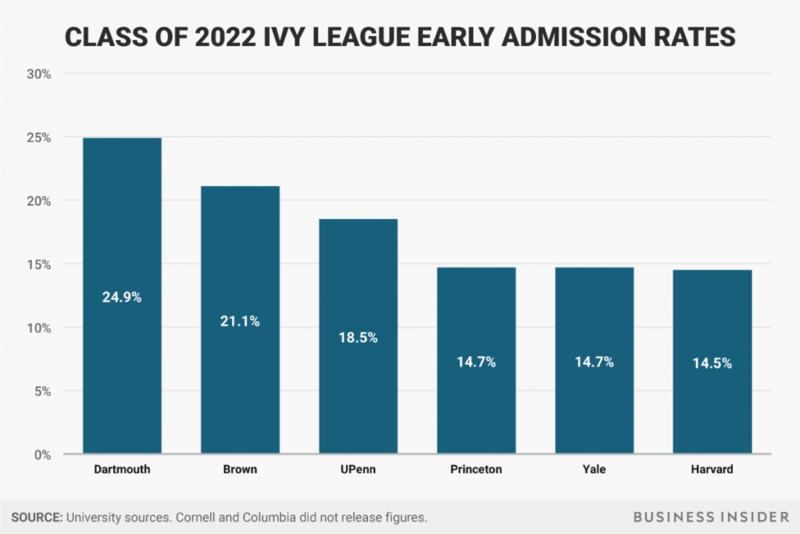 Early admission rates just keep getting lower. However, they are significantly higher than regular decisions rates, so there’s that! Harvard only admits around 5% during regular decision. Thank you Business Insider for the nice chart above (minus Cornell and Columbia). For more early admission numbers, head on over to College Kickstart—the best place, in my opinion—for all of your admissions-related data needs. If you did not get admitted to your top choice school early, highly consider ED II. Applicants (and parents) need to understand the RD numbers. The RD round is tough and ED II can present a significant advantage over RD. Read this chart. Pay particular attention to the percentage of the class filled by early plans.